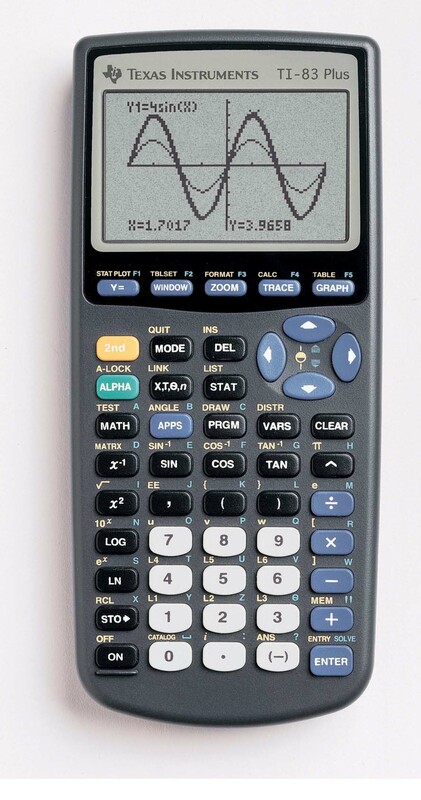 The TI-83 Plus is an easy-to-use basic graphing calculator that features a high-contrast gray scale display. It comes pre-loaded with three applications and can access more than 40 other downloadable, FREE applications. Ideal for middle school through college. Real and complex numbers calculated to 14-digit accuracy and displayed with 10 digits plus a 2-digit exponent. Graphs 10 rectangular functions, 6 parametric expressions, 6 polar expressions, and 3 recursively-defined sequences. Up to 10 graphing functions defined, saved, graphed, and analyzed at one time. Sequence graphing mode shows time series plot, cobweb/ stair-step plot, and phase plots. User-defined list names. Lists store up to 999 elements. Function evaluation table shows numeric evaluation of functions in table format. Interactive analysis of function values, roots, maximums, minimums, integrals, and derivatives. 7 different graph styles for differentiating the look of each graph drawn. Horizontal and vertical split- screen options. Matrix operations including inverse, determinant, transpose, augment, reduced row echelon form, and elementary row operations. Convert matrices to lists and vice-versa. List-based one- and two-variable statistical analysis, including logistic, sinusoidal, median-median, linear, logarithmic, exponential, power, quadratic polynomial, cubic polynomial, and quadratic polynomial regression models. 3 statistical plot definitions for scatter plots, xy-line plots, histograms, regular and modified box-and-whisker plots, and normal probability plots. Advanced statistics features including 9 hypothesis testing functions, 6 confidence interval functions, and one-way analysis of variance. 15 probability distribution functions including Normal, Student-t, Chi-square, Binomial, and Poisson. Business functions including Time-Value-of-Money (TVM), cash flows, and amortization. Full screen interactive editor for solving TVM problems. Interactive equation solver editor for solving for different variables in an equation. Alphabetical CATALOG of all TI handheld operations in one menu. Programming capability with the number of programs limited only by available memory. Link with another TI-83 Plus or TI-83. Receive lists L1-L6 from TI-82. Approved for standardized tests – SAT, PSAT/NMSQT, ACT, AP, IB and Praxis exams. Approved on some state exams. Visit http://education.ti.com/educationportal/sites/US/nonProductSingle/stateoverview.htmlfor more information.